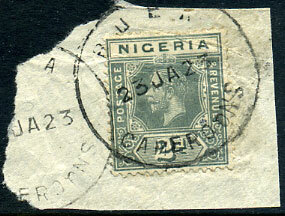 (D4) 23 JA 23 on KGV 2d (SG.3a) piece, some soiling. 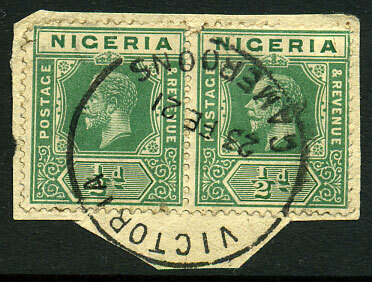 (D1 State 2) 4 MR 20 on horiz. 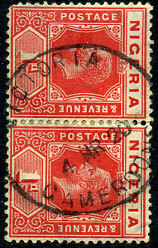 pair KGV 1d (SG.2a), slightly rounded lower left corner perf. 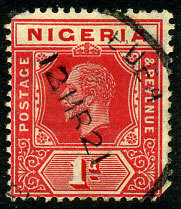 (D3, State 3) 12 MR 21 on KGV 1d (SG.2), corner fault at lower right. (D1, State 2) 23 FE 21, smaller faults on pair KGV ½d (SG.15). 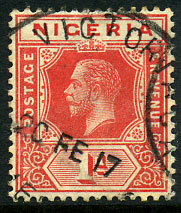 (D1 State 1) 20 FE 17 on KGV 1d (SG.2a).